The discipline of mountain trail goes quite naturally with an aged horse. While an older horse may struggle at the most demanding level of the sport, it can still be quite good for them. Recently I watched a healthy, yet slightly arthritic, 25-year-old horse being ridden at a mountain trail challenge. It was not hard to see that the horse loved the job and was having many muscles stretched in the process—just what that aged mare needed. 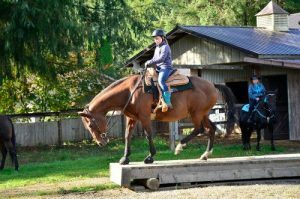 With this idea in mind, let’s consider a few common obstacles and see how mountain trail benefits a senior horse. The “Texas Two Step” is an obstacle where the horse must step up three small steps and then down three small steps. It is a great stretching exercise. The horse I just mentioned was riding a pattern that called for the horse to first walk up three steps and down two, but then stop on the last step and turn around. In order to turn around the horse had to stop and use care to turn slowly without stepping off. This maneuver required it to collect up, stretch back out and then collect up again before stepping off. It was low impact on older joints and warmed up stiff muscles. This horse then moved on to the rolling bridge. Here she had to step up, and on, with great care and then balance herself so the bridge would not move. When she stepped off the bridge it didn’t move which meant she was collected and correct. This obstacle tightened her muscles, but she was able to quickly stretch out and relax again. The next obstacle was a step-down with a 24 inch drop. The mare had to take her time because it really stretched her to the limit. As she continued on the course, however, I noted she seemed to perform with greater ease even as the obstacles became more demanding physically. I noticed, by her third class, that this particular horse had an easier time trotting because her muscles were warmed up and stretched out. The more I watched this mare (ridden by a young girl) the more I realized that she was happy to be working and enjoyed her job. An ex reining horse, it had been fifteen years since she had been in the show ring. Despite some arthritis, the horse was back in her element and it was a joy to watch her. 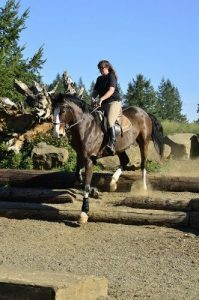 This is the beauty of mountain trail, a sport naturally suited to the aged horse that still has a great mind and is able and willing to help a new or timid rider. We had a veterinarian come out to watch a few aged horses walk and trot through our trail course at Bolender Horse Park to get his thoughts on mountain trail for horses that were old or had old injuries. He confirmed that it is a low impact sport which requires the horse to stretch out its ligaments and muscles. This can only be beneficial to them (aged or otherwise). Happy Trails and Bolender Blessings.